“Soused” fish on brown bread is served with horseradish sauce, slices of radish and snips of dill and tarragon. 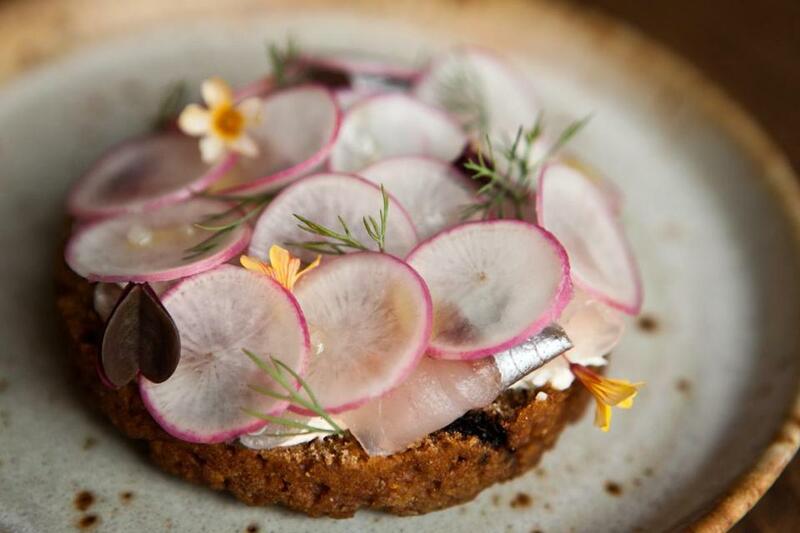 Loyal Nine is one of the most interesting restaurants in town. It will either thrill you or drive you crazy. Enter a room with distressed green walls that look as though they await a final coat. The open kitchen is on your left, the bar behind you. At the center is a long bench that might have been constructed in high school wood shop. “Why am I sitting on popsicle sticks?” one guest is heard to mutter. Ask what’s in one of the well-made, spirit-centric cocktails — the Fine Girl, “brandy, as seen through a strawberry looking glass”; the Wallflower, “floral, frothy with a citrus finish” — and you will get a long answer about the song the bartender’s parents sang to her when she was a baby or the provenance of and methods used to create a particular spirit. The people behind Loyal Nine are purposeful. They are on to and about something. And they are talented. Chef-owner Marc Sheehan ran the supper club Brasstacks and worked at restaurants including Bondir, Menton, and New York’s Blue Hill at Stone Barns. Partners Daniel Myers, Rebecca Theris, and David Beller have experience at the likes of State Bird Provisions in San Francisco, Hungry Mother, and Puritan & Company. Theris oversees the wine program, and it’s a pip: a short, smart list of bottles from independent growers, divided into price categories of $40, $60, and “down cellar.” She’s also the face at the door, welcoming customers. She also made the pottery on which the food is served. Her brother is one of the servers. He helped build the furniture. In another time, this group might have decamped to forge a utopian society. Today they open a restaurant. “We are dedicated to handcraft and make most of what we can in house,” reads the menu. The decor begins to come into focus: It’s the equivalent of the punk band you formed in high school when you only knew three chords. That was the music you could play, and you played it with all your heart. And there is joyousness here, if you order right and talk with the staff and want your food to have stories and meaning behind it. The restaurant is named for a secret group of Bostonians — distillers and braziers and jewelers — who organized protests against the Stamp Act of 1765: a small group of tradesmen in uprising, fighting the power and shaping the future. (Sheehan was a history major at Holy Cross.) Each night there is some kind of roast to share — say, an Ossabaw pork rack. There might be long silver platters of confit chicken legs stacked like dominos, with preserved peppers and molasses, scattered with greens of various shapes and sizes. Or thick, tangy grilled sourdough smeared with pork liver mousse and adorned with apple blossom petals. There are always unbelievably delicious fried soldier beans, salty and crisp with tender interiors, a next-level bar snack. If Loyal Nine could get away with having no silverware at all, one server tells us, they would be thrilled. The fact that this is a conscious, staff-wide desire makes the “With Hands” designation on the menu feel less twee, reasoned rather than random. 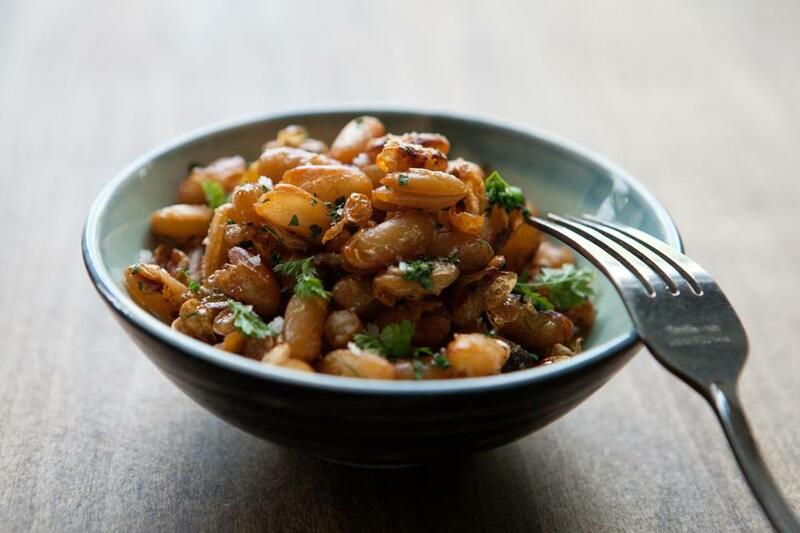 Fried soldier beans in a small dish. Raw, cool, sweet scallop is served still attached to its shell, sliced and interspersed with cool, sweet cubes of pear, the same shade of ivory. Sprinkled with black poppy seeds, herbs, and flower petals, the dish is so fresh and lovely. Creamy aged goat cheese is bundled up inside lettuce leaves, tied into a verdant package and drizzled with hard cider vinaigrette. A disk of sweet, warm brown bread is topped in “soused” butterfish (when we had it, now mackerel) in a light horseradish sauce topped with thin slices of radish and snips of dill and tarragon. (All of the bread at Loyal Nine is stellar, thanks to baker Adam Ross, who also turns out winkle rolls, carrot-parsnip cake, and more at the adjacent cafe.) Tender braised pork in a complex, caramelized glaze is complemented by earthy macaroni made from triticale; anchovies are in there somewhere, but their pungency is undetectable. One evening, a vast silver platter appears, upon which a fish skeleton is glamorously arrayed. This isn’t nose-to-tail but nose and tail. The bonito fillets have gone to other purposes, but the snarling teeth and glazed-over eye and plump cheek and finned end remain, offering tasty, painstaking picking. You could work it over for hours or give up in minutes. It comes with a stack of toast and a little dish of bright green sauce ravigote made with hops. It’s probably the most poetic dish I’ve eaten all year. We are gathered together over nothing, celebrating. We are feasting on leavings. That’s one interpretation. Others include “Waste not, want not” and “There’s no there there.” I adore this dish. I would completely understand someone’s being infuriated by it. 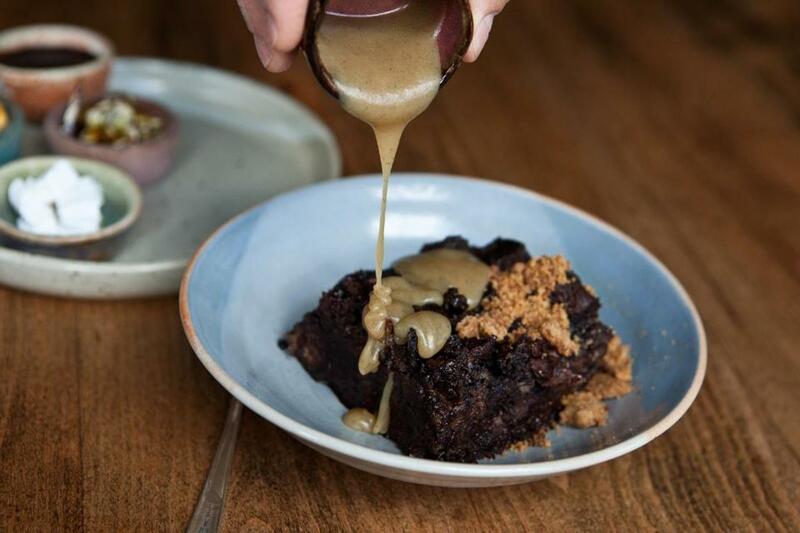 Sourdough chocolate brewis, a bread pudding, drizzled with smoked toffee sauce. There are quite a few such offerings at Loyal Nine. The Aroostook savory supper, a trencher, arrives in a ceramic bean pot the size of an egg cup. Inside are layers of potatoes, onion, and salt pork, topped with an egg. On the one hand, it is delicious and comforting and adorable. On the other, it is tiny and tiny and tiny, and $14. (A friend refers to it as “a wee elvish supper,” then makes me take a picture of it next to a quarter for scale.) The pondemnast is a porridge with mushrooms and turkey neck, plated with a golden egg yolk at the center, surrounded by green spume and various edible foliage. It is as comforting as the supper, and also very savory. After the first bites, though, you are faced with a plate of glop. Presented with preserved shad roe and yogurt, roasted ramps are bitter and uncuttable with the knives provided. A half-lobster, braised with hickory nuts and mead, is served in the shell, lightly cooked, delicious, but not many bites. There are too many dishes here that seem either not quite big enough or not quite good enough for the price. Then it is time for dessert. On the one hand, we’ve got hard cider syllabub, and it simply doesn’t taste good. Maybe there’s a reason we all eat ice cream now. On the other, there is sourdough chocolate brewis, “properly garnished.” That’s bread pudding to you, pilgrim, and it’s your job to apply the honeycomb brittle and spicy pumpkin seed brittle, toasted yeast streusel, brandy marshmallows, smoked toffee sauce, and salted chocolate sauce, served in little dishes. The dessert is generous and clever and makes everyone smile. History offers ideas and inspiration. If we are going to revisit the past, let’s make sure it tastes good.